The first snow fell yesterday here at Hunter’s Honey Farm and even stuck around for a while! The cooler weather is upon us and although Thanksgiving has not come and gone yet, we would like to put this coupon out there in case some of you like to plan ahead for the Christmas season. 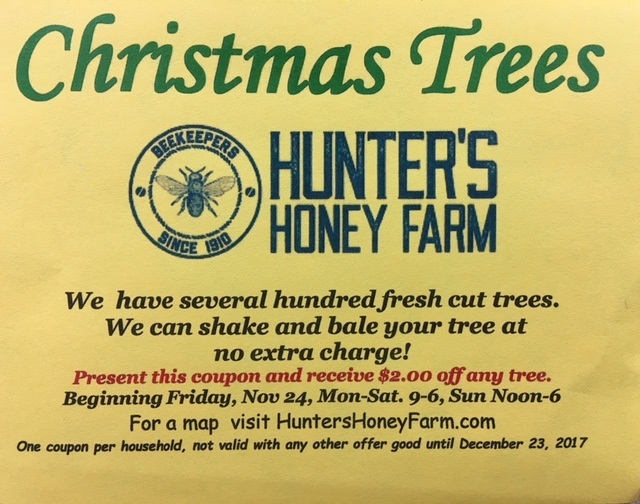 Snap a screenshot and you will get your $2 off of your Christmas tree. 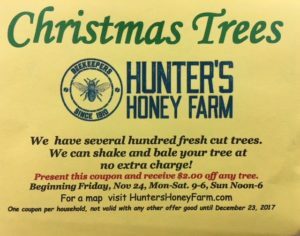 Tree sales begin on Friday, November 24 and we are open Monday through Saturday from 9am – 6pm and also on Sunday from Noon – 6. Hello, I have just found your farm through a google search. We usually cut and purchase our Christmas tree. Your site says “fresh cut” my question is are these trees already cut or are we able to cut our own? Thanks! We do have some that are available for our customers to cut but we also have fresh cut trees that will be taller. I’m wondering what kind of trees you have? Also, how tall are the ones that are available for cutting? Thanks! Thank you for your inquiry. We have White Pine and Scotch Pine available for cutting. Our fresh cut trees are Douglas Fir and Frasier Fir. The trees available for cutting are as tall as 5′ – 6′ this year. Do you guys have live container christmas trees that you plant in your yard after Christmas? If so what is the pricing? We do not have container trees. We carry fresh cut as well as the trees we have planted here available for cutting.